Turkish state-controlled defense technologies company STM has signed a memorandum of understanding with US-based Sierra Nevada Corp. (SNC) to produce a regional jetliner. ANKARA, Turkey — Turkey's selection last week of Dornier to provide primary base models for its future regional jet program puts the aircraft on track to join an indigenous fighter jet in operation by 2023. "By 2023 both [regional and fighter jets] will be in the air," Prime Minister Ahmet Davutoglu said May 27 at a high-profile ceremony for the inauguration of the regional jet program. 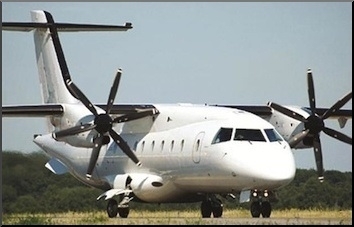 Under the program, Turkey will buy intellectual property rights for the Dornier 328 and Dornier 628 from the US-based Sierra Nevada Corp. (SNC). SNC, owned by Turkish businessman Fatih Ozmen, produces integration solutions for aerospace systems. It employs more than 3,000 people. Turkish procurement officials announced that SNC signed a memorandum of understanding with the Turkish state-controlled defense technologies company STM for joint work on the regional jet program. "The [planned] regional jet will meet both our civilian and military requirements," Davutoglu told a ceremony. The regional jet program will be run by Turkey's defense procurement office, the Undersecretariat for Defense Industries (SSM). All aircraft produced under the deal will be built in Turkey. Under the program, STM will lead and coordinate all subsystem production work. Designated local subcontractors are Tusas Turkish Aerospace Industries, Tusas Turkish Engine Industries, military electronics specialist Aselsan, military software specialist Havelsan, private aviation companies Alp Havacilik and Kale Havacilik, and THY Teknik, Turkey's national carrier Turkish Airlines' maintenance and repairs subsidiary. A procurement official said the regional jet program was the "signature project" of the country's chief procurement official, Ismail Demir, head of SSM. "Ironically, the program reflects the chief's career. It will carry its 'top priority' tag in the years ahead," he said. Demir, an aviation expert, was the general manager for THY Teknik before he took over as top procurement official last year. The official said: "This program intends to combine our aviation ambitions in both civilian and military purposes, just like Demir's career stands today." All aircraft will be produced in Turkey. After technology transfers from foreign manufacturers, both jet and turboprop engines also will be produced locally. The program envisages the eventual production of four models of aircraft: a jet (TRJ-328) and a turboprop (TR-328) with 32 seats, and a jet (TRJ-628) and a turboprop (TR-628) with 60-70 seats. Turkey pledged to place an initial order of 50 aircraft after the 328 makes its maiden flight in 2019 and the 628 in 2020. Procurement officials said the military 328s will be used as ambulance aircraft, maritime patrol aircraft, VIP aircraft, transport aircraft and for intelligence missions. The Dornier 328 is a turboprop-powered commuter airliner. It was initially produced by Dornier Luftfahrt, which in 1996 was acquired by Fairchild Aircraft and renamed Fairchild-Dornier. The Dornier 328 was produced at the company's Germany plant and sold worldwide from its Texas offices. Fairchild Dornier also undertook the Fairchild Dornier 428JET program to develop a 44-seat regional jet.